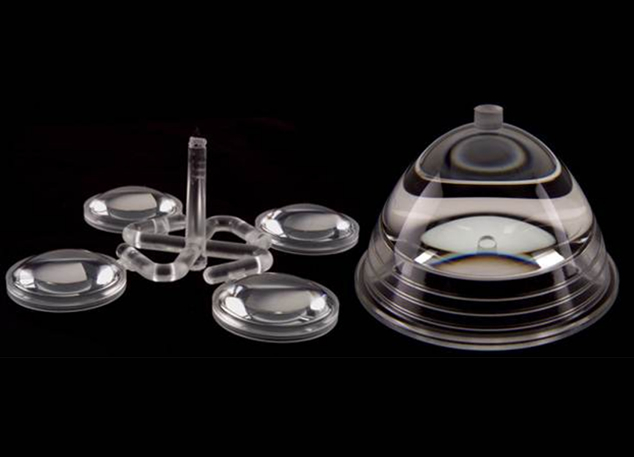 Polymer optics offer serious advantages in terms of their light weight, low cost and high malleability. The key manufacturing techniques of injection molding or diamond turning ensure 100% repeatable levels of precision, levels difficult to achieve using more traditional glass solutions. Market results are clear, e.g., products such as the pill camera at middle right – a Syntec manufacturing breakthrough. However, while polymers with improved characteristics emerge regularly, some applications require other optical or electronic approaches. The mask insert at the lower right, for example, marries a thin layer of glass with polymer for light weight and durability without compromise. The fingerprint identification system, shown at top right, uses optics that integrate easily to diverse packaging, saving total manufacturing expense – by design. Hybrid, adj. – combines materials of different origins, which by implication perform better together than either alone. At Syntec 100% solutions are our goal.